Extract the natural juice of grapes, berries, and other high-liquid fruits with the power of steam. Just boil water in the bottom container and place fruit in the top container. Natural concentrated fruit juice drips in the center pan where it can be extracted through a surgical-quality, heat-resistant tube. Use the juice for making jellies or to store as concentrates for healthy natural fruit juice. 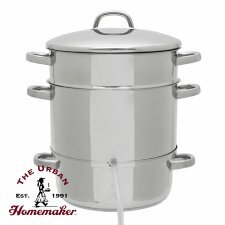 Use the stock pot in the same way you would use any other pot. 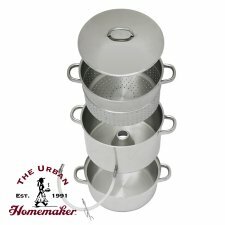 Great for soups, meats, vegetables, and more. Can also be used in the oven as a roaster. The stock pot holds up to 8 quarts and has a clad bottom for even heating, making it ideal for any cooktop, including smooth top and induction ranges. Mrs. Wages Pasta Sauce Tomato Mix 5 oz. Simply boil water in the bottom pan and place fruit in the top container. The concentrated fruit juice drips into the center pan where it can be extracted through a surgical quality heat-resistant tube. 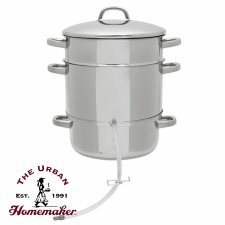 We made 40 quarts of grape juice almost effortlessly with this steamer! And all in a fraction of the time it takes with other methods. Comments: This is a great time saver when you want to juice any fruit for jelly. It comes out so pure and clear. I do run the juice through cheese cloth when making Prickly Pear Jelly though. It really cuts your time when making jelly. Would you recommend this to a friend? : Absolutely!